For the latter part of the 20th century, South Africa's draconian apartheid system of legally inscribed racial oppression was a point of international opprobrium and crippling international boycotts. The West's moral disgust with the stringently oppressive racial policies, however, was undercut by its strategic military alliance with South Africa against the leftist, sometimes Soviet or Chinese-supported, anticolonial insurgencies in southern Africa. In 1990 apartheid's approaching end was signaled by the release of Nelson Mandela, the most prominent leader of the insurgent African National Congress and the world's longest-held political prisoner. By the time the ANC won the nation's first multiracial elections in 1994, the colonial legacy of a deeply entrenched inequity in every area of life had become theirs to address. In 1990, a few months after Mandela's release, Martha Rosler accepted an invitation to visit, with the permission of the ANC to cross the lines of cultural boycott. Rosler taught video to Cape Town university students and worked with NGO-supported township community groups ratcheting up their media production. In the months she spent there, she was in contact with various groups in the radically charged political landscape, often documenting her encounters. She videotaped conversations with South Africans across the social spectrum: comfortable academics, black squatters and township residents, dissatisfied Cape Coloured tenants of public housing, colonials in Lesotho, white farmers, and the small group of colored and black people striving toward home ownership. Through these interviews and images of homes and shantytowns -- interiors and exteriors, newly built or perpetually crumbling -- Rosler accumulates what seems to become a body of shifting subjectivities collectively renegotiating what citizenship can mean in a post-colonial African state. 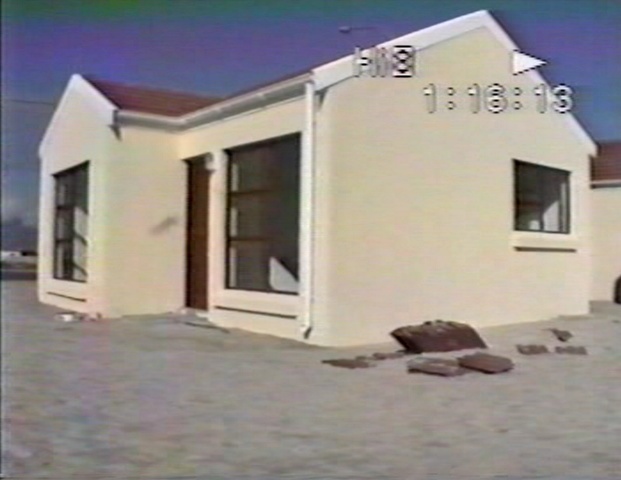 Her resulting videotapes, in production for several years, were never formalized into completed works, but an edit focusing on housing is being screened publicly for the first time here as a VHS "rough cut" from 1995. The artist will provide some live commentary during the screening. Followed by a conversation with Rosler and Bosko Blagojevic. Martha Rosler works in multiple media, including photography, sculpture, video and installation. Her work on the public sphere centers on everyday life and the media as well as architecture, housing, and the built environment with an eye to women’s experience and differentials of power. Investigating the landscapes of the everyday, she has produced works on systems of airplane, automobile, and metro travel. Rosler has long produced works on war and the “national security climate”; recent solo exhibitions have centered on the war in Afghanistan and Iraq. Other works are excavations of history, including the bus tours “An Empty Space in Ottensen” (Hamburg,1993) and ”Liverpool: Delving and Driving” (Liverpool Biennial, 2005). Others include “Unsettling the Fragments” (Sculpture Projects Münster 07) and “Kassel Gardens from the Perspective of a Mole” (documenta 12,2007); and “Location, Location, Location” (Portikus,2008), linking Frankfurt history and architecture. An on-going project, the Martha Rosler Library, has toured the US and Europe since 2005.